The football season has begun but the battle between Sky Sports and BT Sport for viewers is more bloody than anything on the pitch. Sky has secured David Beckham for its ad by Brothers and Sisters. BT’s spot, by Abbott Mead Vickers BBDO, reminds fans it is the only place to watch games from four tournaments (the Premier, Champions and Europa Leagues, and The FA Cup). But has either platform found the back of the net? We asked two creative chiefs to rate the form so far. What a brilliant thing to get paid to do – come up with a killer film to launch a major brand’s coverage of the new footy season. Wow. Think of all the great football ads that have gone before, some of which have been the greatest ads ever made. Sadly, in both these instances for Sky and BT, it just looks like nobody gave a toss about either of these briefs. In Sky’s, it has even been given David Beckham to play with… yet all someone has come up with is him running through a series of increasingly mundane scenarios, which basically feature people just watching the telly or walking to a match. And then we are told: "Whatever happens, don’t miss it." Er, but nothing happened. In BT’s "Four competitions. One venue", we get to learn that all four major competitions are covered. OK, at least that’s something. But the best anyone could dream up was a mind-numbing and instantly forgettable four-way editing technique. It strikes (pun intended) me that, in both cases, there has been an unforgiveable lack of ambition on both briefs. Both agencies can do so much better. If I had to choose, I’d say Sky’s Beckham ad just edges it. But only ’cos it’s Beckham. Confidence is everything in football. Confidence has made Man United a contender again as Mou and Zlatan exude it from their puffed-out chests. Confidence and an eye-watering outlay of #Pogback cash. But even that was a deal done on sheer confidence. 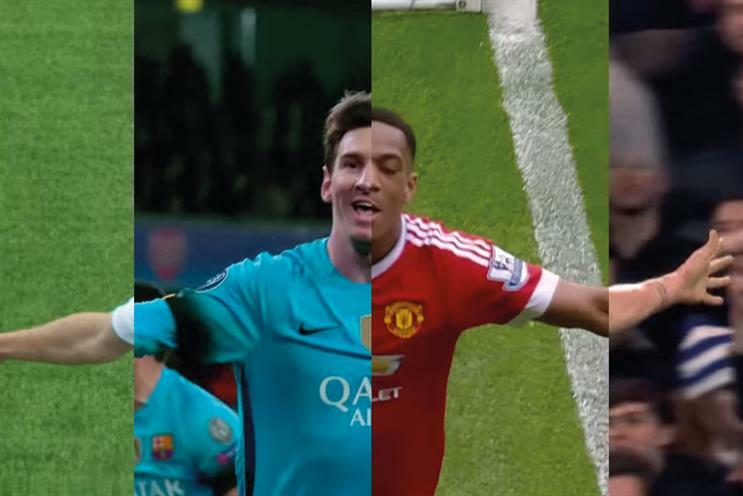 Is confidence everything in football advertising? If it is, BT looks to me like the more confident of the two. It has a hell of a 4-4-4-4 formation and it is letting the ball do the work in the simplest, most iconic way. The print work and posters, especially, which are both a triumph of retouching and an engagingly beautiful corpse-guessing game for the average football fan. They are big and impactful and make BT look like it means business. Which it undoubtedly does. Sky has more of the feel of LVG-era United: shorn of confidence despite attempts at grandstanding, relying on past glories by pulling the emergency Beckham cord – but to no great effect. Actually, for Sky, the more confident move has come outside the advertising, with the re-signing of the true Sky pin-up boy Gary Neville, rather than the traditionally more poster-friendly Becks.